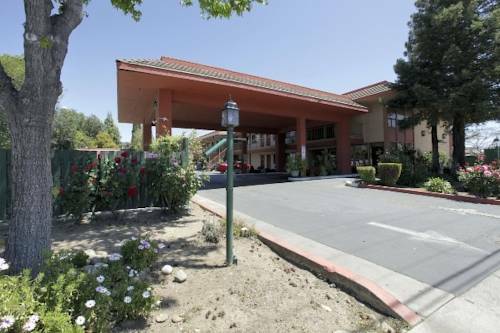 Located at the intersection of Highways 101 and 152 just blocks from the Gilroy Premium Outlets, Gilroy Gardens Theme Park and just 34 miles from Norman Y. Mineta San Jose International Airport, the Days Inn Gilroy hotel offers comfort and value in the heart of northern California. Wineries like Stephens Winery, Rapazzini Winery, Sarahs Vineyard and more are close by, as well as several restaurants, golf courses and businesses. Amenities at this smoke-free lodging facility include complimentary continental breakfast, ample complimentary large vehicle parking, a business center, and complimentary wireless Internet access. Relax in the outdoor pool, refresh clothes in the guest laundry facilities and meet with colleagues or loved ones in the event space or outdoor lounge area. Guest room amenities include a flat screen HDTV, microwave and refrigerator, and handicapped-accessible rooms are also available. There is no charge for kids 17 and under with an adult in the same room.